After a bit of a break, Clothing Tall Men is back with a couple of options for tall men's jeans from some less obvious places. 34 Heritage is a high end (and high price) brand. Their Charisma cut features a classic waist, falling just below the belly and higher on the back for the most comfort. Trim thighs in the back eliminate the extra material and excessive fabric. An elegant straight leg follows along the entire leg. 36 inch inseam available in 30 - 40 inch waist. I found this style for sale on the Allen Edmonds web site - normally the home of shoes and all things leather. You might find them cheaper elsewhere if you try. Today's other find is a Jos. A Bank exclusive. 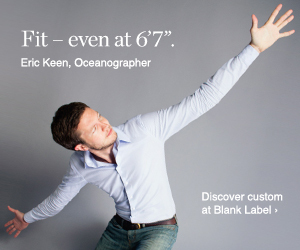 While the company is better known for its dress clothes, there are some casual clothes in tall as well as big sizes. 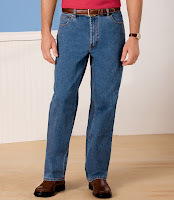 These jeans are more practical; designed to wick moisture away from your body and keep you cool and dry, the tall size jeans are lighter and cooler than traditional jeans. Special frabric technology gives a wrinkle-resistant finish that keeps shape and resists shrinking. 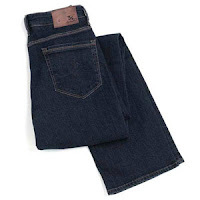 Available in a 38 inch inseam from waist 36 - 40 and 36 inch inseam from waist 36 - 44.